Brown ground beef and drain off grease. 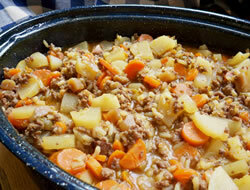 In the bottom of the slow cooker, layer the onions, browned ground beef, potato slices, and garlic. Add the diced tomatoes and tomato soup; spread out evenly over the potato layer. Sprinkle the salt and pepper over the top; place cover on slow cooker. Cook on low for 5 to 6 hours or until potatoes are tender. Note: If you want to speed the cooking process up a little you can cook on high for 1 hour and then turn the heat down to low and cook for another 3 to 4 hours. 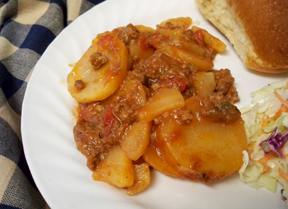 "Very tastey!I used stewed tomatoes in place of the diced plain, just chop them really well. I used my frying pan to chop them in with a fork then you don't dirty a dish." "I made this yesterday and plugged it in before I left for work. When I got home it was done and ready to eat. It was great and we got to eat early. 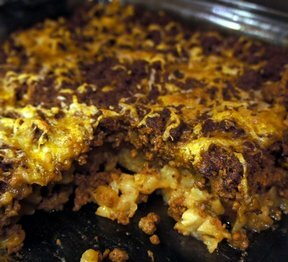 This makes a perfect weeknight meal after working all day."